Workshop registration has been closed. The maximum number of participants has been reached. The focus of the Community Workshop on Unmanned Aerial Systems for Atmospheric Research, hosted by NCAR/EOL, will be to advance the use of Unmanned Aerial Systems (UAS) on all scales of atmospheric research. UASs are currently a rapidly developing field with many activities at the University level, within a number of federal agencies, and in private industry. The thematic focus of this workshop is on emerging needs related to the use of UAS for all scales of atmospheric research. The objective of this community workshop is to create a forum for discussion and for gathering input from the active UAS research community and those interested in becoming part of that community on highest priority observational needs that may be met by UAS and on barriers for use of UAS in atmospheric and atmosphere interface research. EOL is coordinating this gathering in our role to provide support for the observational needs of the of the NSF supported science community. Identify key areas for UAS research (such as forecasting, flux measurements, pollution, constituent measurements, and boundary layer and atmospheric interfaces research). Identify typical and novel instrumentation for UASs. Examine 2D and / or 3D wind measurements from UASs. This is a unique problem and a key measurement for many UAS. Discuss needs for calibration of UAS instruments and verification of UAS based measurements. Discuss UAS operations and how to fly in hazardous conditions such as strong winds, icing, rain, and low visibility. Understand evolving FAA UAS regulations and requirements and identify efficient ways to work with the FAA to guarantee safe UAS operations. Discuss other novel ideas for lower atmosphere in situ observations that EOL could support. 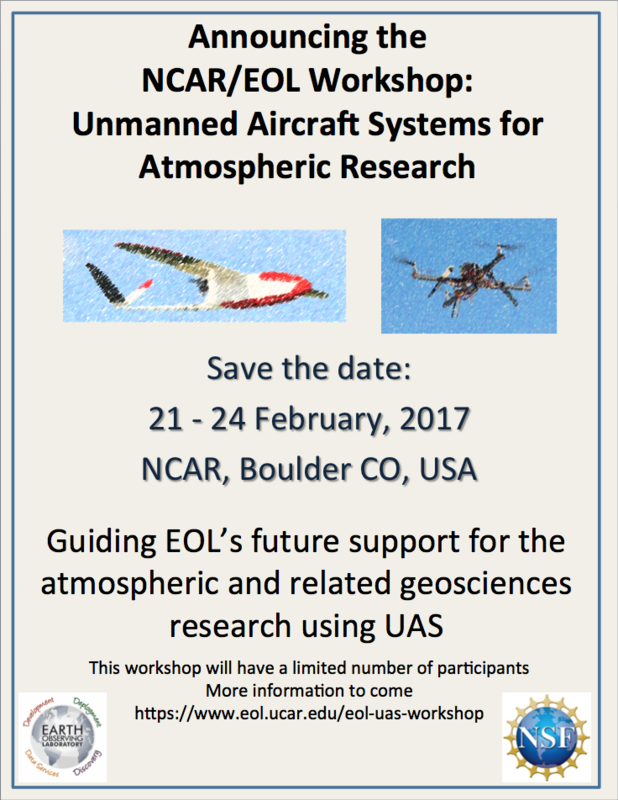 The workshop will take place February 21-24, 2017 at NCAR in Boulder. Space is limited so register early to guarantee a spot. A number of speakers will be invited to provide input based on their activities in this field. Participants will come from the NSF community and other US government agencies (NOAA, NASA, DOE), with contributions from key international institutions as well as a small number of participants from the private sector. The workshop format is intended to allow for plenty of discussion.